Southern California Firestorms -- As of December 14, the Thomas Fire in Southern California consumed more than 230,500 acres, forcing evacuations. Amateur Radio volunteers provided communication for American Red Cross shelters in Ventura and Santa Barbara counties, passing traffic between evacuation centers. A Ventura County Auxiliary Communication Service (ACS)/ARES net was convened December 5 to support Red Cross shelters there, providing communications between shelters. Radio amateurs also deployed to the Ventura County Emergency Operations Center (EOC). According to ARRL Ventura County District Emergency Coordinator Rob Hanson, W6RH, the ACS/ARES volunteers staffed four evacuation centers, in addition to the EOC. Santa Barbara Section Manager Jim Fortney, K6IYK, reported an Amateur Radio Digital Network (ARDN) MESH video system has live streamed images from several sites, as long as it remains up. "Loss of primary power has required using the solar power backup capabilities, but, unfortunately, the heavy smoke has made that backup less than fully reliable," he said. In addition, some sites were down because of power outages, and at least one hilltop site was overrun by fire. "The Santa Barbara District ARES organization works closely with Santa Barbara County OEM and is prepared to support any requests as the Thomas Fire continues to burn into Santa Barbara County," Fortney said. Rich Beisigl, N6NKJ, reported that the Fallbrook Amateur Radio Group and other groups in the North County (San Diego) provided communication at some evacuation centers, and the Red Cross activated its Amateur Radio group. He said a group in Carlsbad also was providing shelter communication support. For ARES® activity and data for your Section, please view ARES Annual/Monthly Reports. If your Section's ARES report is not found there, please check with your ARRL Section Manager for the important data. This documentation helps you compare ARES activities across your Division and the rest of the country, and can also help you in supporting proposals for Amateur Radio as an emergency/disaster response asset before local, county and state emergency managers. The data is also used by ARRL Administrative Staff and Counsel in buttressing ARRL/Amateur Radio positions and comments filed in various FCC rulemaking proceedings, including those involving spectrum defense. In September, nearly 40 Amateur Radio volunteers converged on Springfield, Illinois to support the Capital City Century, a cycling event. The "Century" is the largest in the area for which the amateurs provide not only communications support, but are also responsible for logistics, safety and operations. 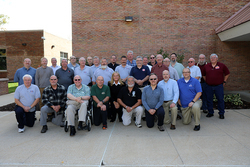 Amateur Radio operators from six counties included three ARES® Emergency Coordinators, Emergency Medical Technicians, Firefighters, and Police Officers. Jess Hunter, W9ABS, who coordinates and organizes communications and operations, said "the amateur community has skills in addition to radio communication skills, which brings added value to the event organizers." Hams provide logistics support by replenishing water supplies at field locations, addressing issues out on the routes, and providing medical intervention for minor injuries. Event Safety Officer Rich Marx, KB9TZS, said "I am also a licensed EMT; it only makes sense to bring that training, knowledge, and skill set to an event like this." This year's event drew 750 cyclists, with more than 120 ham and non-ham volunteers in supporting roles. One key to event success is the planning that occurs months in advance; the Amateur Radio team participates fully in the planning. providing the Amateur Radio operators with this comprehensive information, they are able to look up and answer questions in the field, thus reducing the need for over-the-air consultation, keeping frequencies open for possible critical issues. Hunter gives the following example: "If a participant wants to know the location of the next water or food stop, instead of the radio operator contacting Net Control asking for the information, they already have this routine information available to them in the field through the use of the Incident Command System methodology." In addition to promoting a smooth running event, using the ICS exposes the operators to the forms they would encounter in an emergency or disaster response typically managed under the ICS. Hunter states that for planning purposes he uses a mass evacuation scenario, a function operators could be called upon to support in an emergency or disaster situation. By participating in this event, not only is Amateur Radio providing a service to the public, the operators are also training for potential real-world disaster situations. Harv Koplo, the organizer for the Century, said "We appreciate the added level of organization and safety the Amateur Radio crew brings to our event. Over the course of the five years I have coordinated the Century, the two groups -- cyclist support volunteers and ham volunteers -- have evolved into a single team to insure the safety of our riders and increase efficiency. I have participated in rides from New York to Illinois, and we are the only event of this type using Amateur Radio operators in this fashion." Strong relationships have been forged between the amateur community and the key stakeholders for this event. Every year the Amateur Radio team receives numerous compliments on its professionalism and dedication. The event also gets newer hams involved. Ben Gaul, N9HHI, had never worked one prior to the Century and was assigned the position of Resource Net Control operator. Under the direct guidance of Logan County Emergency Coordinator Jeremy Wells, KC9WMV, who serves as communications manager, Gaul learned new skills and gained experience in the communications trailer. Another new ham, Matt Joseph, KD9IUV, was paired with veteran Jim Grimaldi, N9DUI, to help provide field support functions, learning as he participated. Wells stated that "the communications trailer functions more like a Public Safety Incident Command Trailer than a Net Control Station. With multiple radios providing amateur voice communications, a computer screen keeping track of mobile units via APRS and systems that pull information from the National Weather Service Doppler to keep track of weather events makes for a busy work environment." Wells continues, "Having direct contact with the local weather service office via Amateur Radio is a big plus.The day of the event a staff member in the local weather service office is assigned to monitor weather patterns. Having that higher level of support from NWS is a big help." This year's event saw the creation and appointment of the ICS Logistics Section Chief, filled by Tom Labonte, KD9FZF. With the help of Jamie Ursch, KD9FZI, and Pam Rock, KD9JER, he was busy making sure that water, food and other supplies were available and that all volunteers were fed. Al Tabor, N9MAF, performed the function of backup Net Control at a location separate from the main Event Command location and was always at the ready to take the helm should an incident occur that required the need for additional Net Control resources. Having Tabor there for redundancy added another layer of support and stability. Kevin Kesselring, KC9IGM, the Chief of Police for Pleasant Plains, Illinois, a community that sees hundreds of participants pass through during this event, stated "The planning and organization is evident the day of the event. This is a great training opportunity for the ham community, and as a public safety official I am glad to see the level at which Amateur Radio can perform." Chief Kesselring said that "in the world we live in today, Amateur Radio has to compete with other forms of communication technologies that do not require a license, and it is good to see that Amateur Radio operators are willing to step up and do more than just provide communications support. This makes them a force multiplier and increases the opportunities for Amateur Radio in a time of need." Muskegon County (Michigan) Emergency Communication Services (MCECS) recently hosted a specialized Amateur Radio training class. The course, Auxiliary Communications Training, or AUXCOMM, provides instruction to groups and volunteers that provide radio communications services and support to public safety agencies. The class was created by the US Department of Homeland Security's (DHS) Office of Emergency Communications (OEC). Students completed the 2-day, 20 hour course on October 28 and 29 at Muskegon Community College in Muskegon, Michigan. The class was instructed by Michigan instructors through OEC's state-sponsored, OEC Recognized Instruction program. "The class teaches amateur service operators how to develop and formally document amateur communication solutions based on the needs of incidents, exercises and planned events," explained lead instructor Raymond Hasil. Support Instructor John Imeson added, "The solutions and documents they create become a part of the incident action plan, or IAP, that public safety agencies use to manage major incidents." Hams worked to grant a dying Vietnam vet and radio amateur a last wish of making one more contact recently. It was David Hartnett, K9DRH, and crew Don Whitney, K9DRW, James Nelson, K9QF, Harry Hahn, WB9R, Scott Campbell, KC9SJP, and others who made it happen. An account of the event was published in the local section of the Chicago Tribune. The story is about John Nugent, WA2EQJ, a U.S. Army Signal Corps member in Vietnam, who came home from the war to feelings of isolation and found ham radio to help ameliorate them: he could socialize with others around the world. At a health care center in Chicago recently, Nugent's wish of one last QSO was realized. As many of us old timers did, he had made his first radio out of a cigar box when he was 9 years old. He told the facility staff that he was a ham since he was 16, and never let his license lapse. The American Legion Amateur Radio Club, the North Shore Amateur Radio Club, Lake County Emergency Management and the Lake County Sheriff's Office all offered to assist in meeting his request. Lake County RACES set up antennas and his radio. Nugent made several contacts. Nugent had volunteered for the Army and was wounded in the leg by shrapnel. His career as an electrician followed. After the QSOs were "in the log," his son Chris walked around the room thanking the Lake County RACES and other volunteers who facilitated his Dad's last wish. It's been a year of natural disasters across the country on a scale that I cannot recall ever having been more horrific, from tornadoes to West coast wildfires to Atlantic hurricanes and more. As this is written, wildfire is raging across southern California in a month that is usually reserved for mudslide and flooding season. The Los Angeles Times reported no major wildfire had ever occurred in the state in December; California's wildfire season is usually summer and early fall. Of the 20 largest California fires since 1932, 14 have burned since 2000. The five largest have all occurred since 2000. It's also been a hurricane season to remember, with horror: the humanitarian crises of Puerto Rico and other Caribbean islands, the flooding that Harvey wrought on southern Texas, and here on the Florida peninsula, the march up land of Hurricane Irma that, according to some reports, spurred the largest evacuation in US history, put large segments of the population into shelters, and locked me into the hospital to work and live for almost 60 hours. Amateur service licensees worked in partnership with emergency/disaster response agencies, responding at all levels of government, and for the Red Cross and NGOs over the course of the year. ARRL Administrative HQ staff supported the ARRL Field Organization, and HQ's Emergency Preparedness Manager Mike Corey, KI1U, traveled to Puerto Rico with radio and other equipment made possible by donors to Ham Aid, to represent HQ and personally add to the response and recovery effort there. Countless other examples of support abound, and have been documented in QST and other outlets. One asset that seems to me to be underutilized and could evolve to be a force multiplier in community and neighborhood response and safety in disasters is the CERT program. I know I sound like a broken record; I've harped on this subject numerous times. The ARRL supports the Community Emergency Response Team (CERT) construct, and has formally supported it since 2003, when the League became an official affiliate program of Citizen Corp, the DHS initiative. The Statement of Affiliation makes ARRL an affiliate under the four charter Citizen Corps programs--Neighborhood Watch, Volunteers in Police Service, Community Emergency Response Teams and Medical Reserve Corps. The premise of CERT is undeniable: when a disaster occurs, a neighborhood or entire community could be isolated for days, inaccessible to first responders. Residents are on their own, and must take care of themselves. The CERT program trains them in basic disaster response skills, such as light search and rescue, First Aid, fire management, and radio communications. A team can be trained by local emergency management staff in the classroom, and organized at a local community center or even a neighbor's living room. Radio amateurs are found in just about every neighborhood, and they make logical key members of CERTs, especially when it comes to establishing communications with the outside world. To start, please check FEMA's CERT web page here. Finally, thank you being a reader of the ARRL ARES E-Letter. There are almost 40,000 of you across the country. Best wishes from the editorial and production staff for a great holiday season and happy new year!